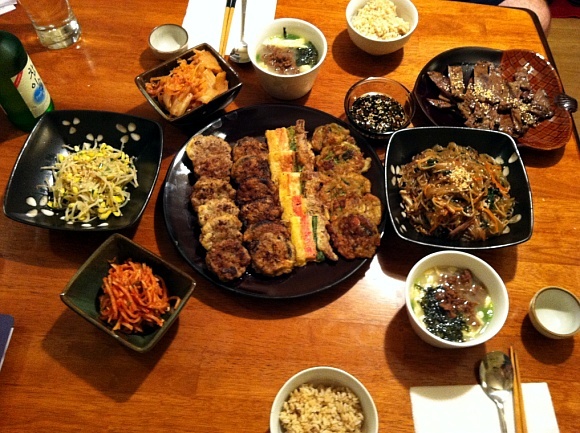 I cooked a lot for 2012 Lunar New Year! But, instead of sit down and be sad, I stood up and cooked almost of my family tradition lunar new year’s food! I couldn’t make all of the family tradition foods by myself, especially I had only 4 hours to cook. So I made only my favorites! because we’ve got to eat it for new year!! Read more about the rice cake from my another post! 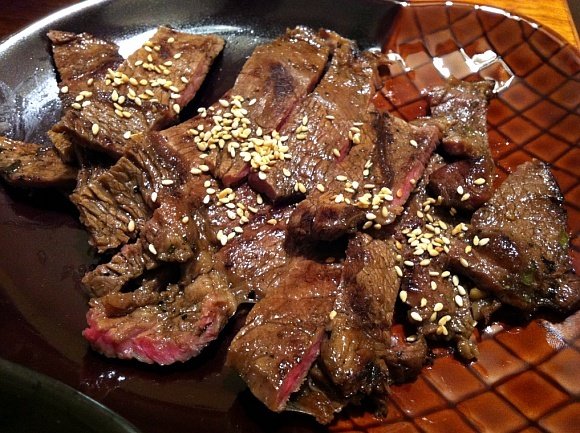 First I started with Korean style steak, call by Jeok. Because it needs to be marinated for a while. 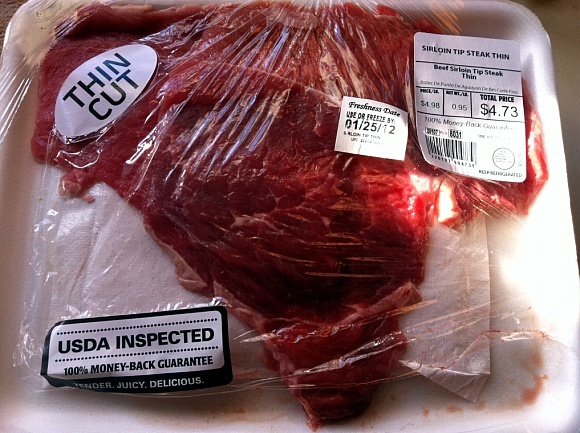 This is the meat I got from Walmart, thin cut sirloin steak. Combine all of ingredients in a wide bowl. Pock the meat with a fork several times so the meat will absolve the flavor very well. 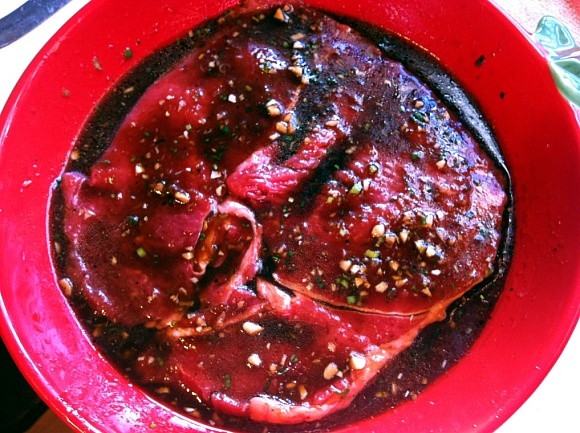 set a side marinate for 30 minutes. Jacob grilled this meat for me, while I was cooking other foods. We like our meat medium-rare, so he cooked it 2 minutes each side on very high heat. It was tender and juicy~!! And using another piece of the meat, I made Japchae!! 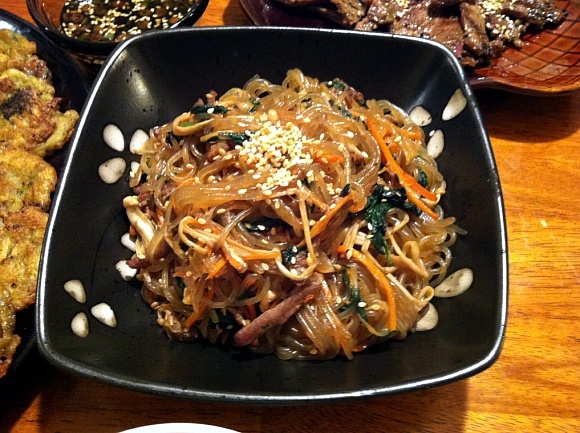 Japchae is Korean stir-fry noodles with meat and vegetables. Japchae (jabchae, chapchae) is a Korean dish made from sweet potato noodles (called dangmyeon), stir fried in sesame oil with various vegetables (typically thinly sliced carrots, onion, spinach, and mushrooms), sometimes served with beef, and flavoured with soy sauce, and sweetened with sugar. 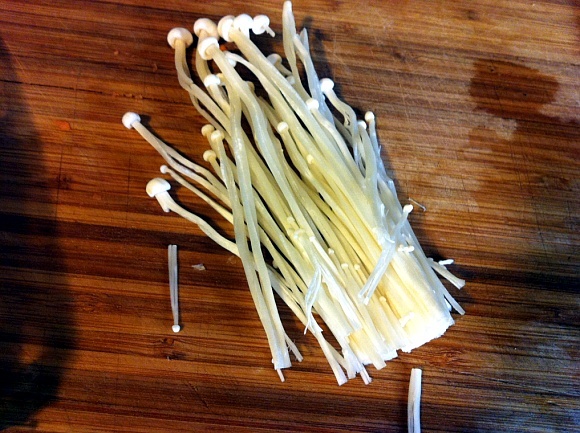 It is usually served garnished with sesame seeds and slivers of chili. It may be served either hot or cold. I made with onion, spinach, carrot, enoki mushroom, beef and Korean glass noodles. I used in my donggeurang-ttaeng also! 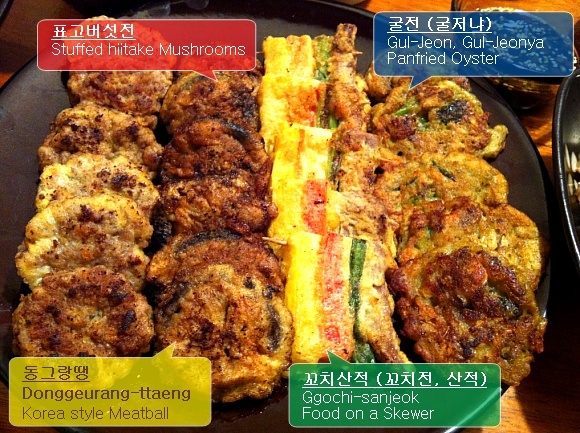 It’s Korean style meatball, mixture of ground meat, vegetables, egg, cornstarch (or flour) and seasoning. My version of it is..
You can season with soy sauce if you like to. I didn’t put any flour, starch or egg either this time. Even though I usually do. Because I wanted to make it really meaty. In a large bowl, mix all of the ingredients and mix very well until mixture becomes sticky. Form a walnut size balls and then press lightly into shape. Like a slider patties. In a small bowl, pour 1/2 cup of flour. In another small bowl crack an egg and beat it well. Heat a large skillet over medium heat; add oil. 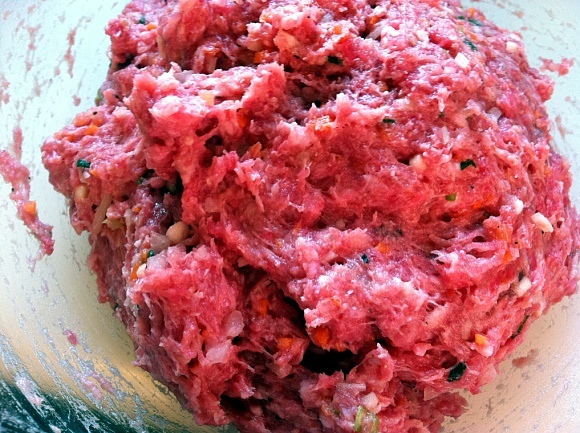 Coat the patties with the flour first, shake off the excess flour. And then put it into beaten egg, coat well. Place on heated and oiled pan, cook 4 minutes on both side, until golden brown and cooked through. Drain excess grease on paper towel. I will keep posting all other foods on next post! Ground turkey, 2 different ways! Quick Smoothie with Leftover Silken Tofu!